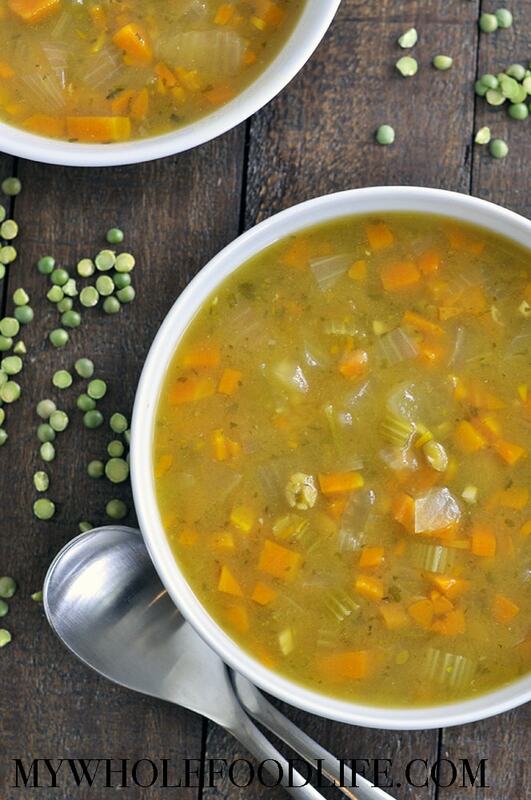 Vegan Split Pea Soup. Today was a bit chilly for Dallas. It was in the 60’s. I know some of you in colder climates will laugh when I say this. It’s been 9 years since I moved from Boston and my blood has thinned so much. So today was a day for soup. Soups are also a great way to make use of ingredients that may be going bad soon. We do that all the time. Also, soups freeze very well. I will usually freeze it in serving size containers so I just drop it in my husband’s lunch for work in no time at all. He brings his lunch everyday. It is one of the many ways we stay healthy and save money. 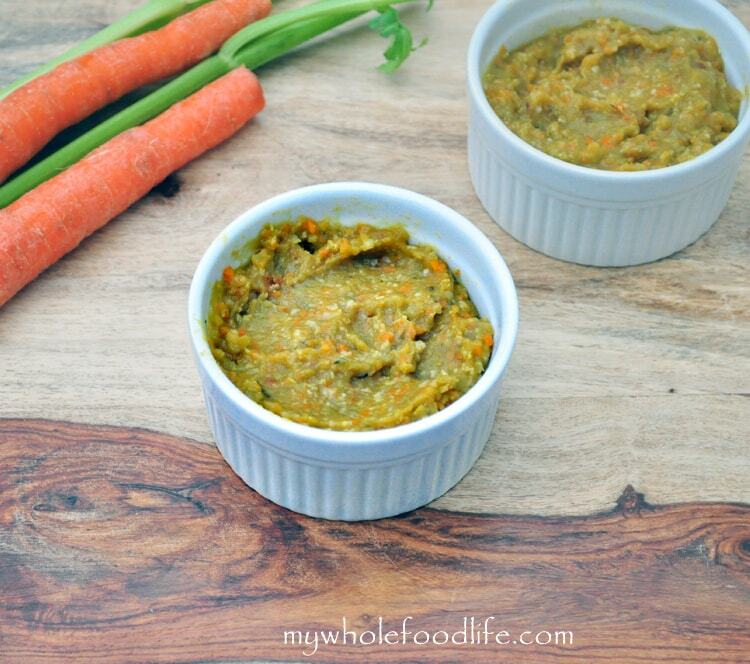 Chop the carrots, celery, onion and garlic up in the food processor. Throw everything in a large pot and cook on low for about 4 hours. You can easily do this is a crock pot as well. Our crock pot is on the small side, so we did this on the stove. You may need to add a bit of salt. I got at least 5 servings out of this soup. Enjoy! How many servings will this make? Looks yummy! Maybe tomorrows supper! It sounds really yummy! I have never cooked with / used millet before ! If you don't have millet, you can feel free to sub with quinoa or barley or maybe even rice although I have not tried to yet. I used the grain, not the flour. I hope it was still edible? oh bummer.................did you eat it ? was it ok?? I used barely and it was yummy ! barley works great as a sub. This was with dried beans right? Yes. Dried split peas. They do not need to be soaked before use if slow cooked in the crock pot. Did you use 4 c. dried peas (or compensate for cooked split peas)? Thanks! BTW: really enjoying your site... I'm in the process of switching to vegetarian/vegan diet. Sorry, I meant 1.5 c. dried peas. Try a SMALL pinch of Allspice..mmmm. This was good, but I found out I have a sensitivity to split peas :( Giving the rest of batch away! If you can eat lentils you can do this with yellow or orange lentils or french blue lentils. Cooks for a bit less time. So you can just put the quinoa in with everything else and it will cook just right. No added broth or water or seasonings? This is easy. I have all ingredients now too :D I dread cooking and love your easy things. Thanks as always. I think that should be just fine. Hey ! Excited to make this but I don't have a stove so I have to use a crockpot. First time I'm ever using it so I don't really know how to convert any recipe for a crockpot. How long would I leave it and what setting ? You can cook it on high for the first hour and then turn down to low for a few more hours. You can tell it's done when the split peas completely break down. How ironic! 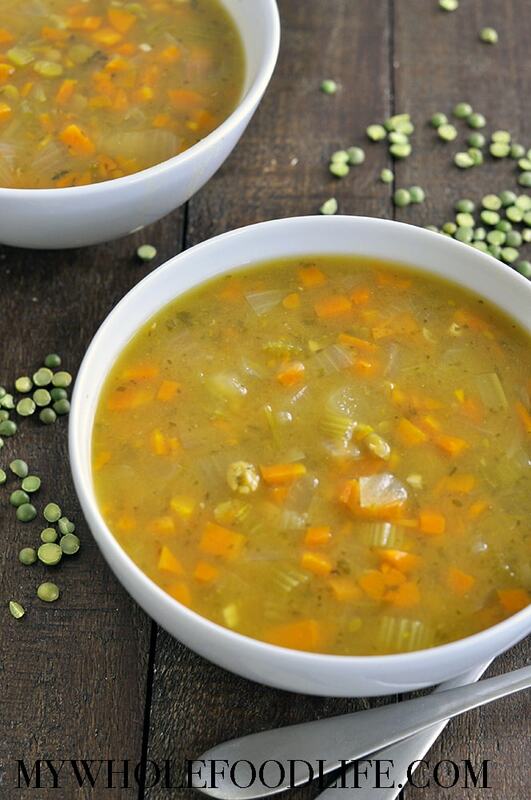 I had split pea soup for the first time ever this weekend and was wishing I could find a good homemade recipe and here it is!! Must be meant for me to make this. I loved it and can't believe I never ate it before. So good and I will definitely try this! I don't have a food processor. Think it would work if I chopped up the veggies small? Maybe mashed them a bit at the end? I love this recipe- have made many times to freeze for future lunches. It is a yummy soup. Have you or any readers tried it in a pressure cooker? I am trying to switch over some recipes. Thank you! Hi Georgina! So sorry you are having an issue. What browser are you using? I just tried doing it on Chrome and it worked fine. Did you try the pin it button at the top of the post? Those also work.